When I started RV Tailgate Life, there was really only one rule: Don’t f* up the tailgate. And the biggest way to f* it up is to disregard RV safety rules. Here is the must have RV safety gear to keep the road trip and tailgate rolling! Carbon monoxide is invisible and odorless. And very deadly. In RVs, carbon monoxide usually results from vehicle or generator exhaust, pas powered heaters, and LP gas appliances. Even better than a carbon monoxide detector is two carbon monoxide detectors. Get one for the living space and one for the bedroom space. Get the 10 year battery powered detectors for premium RV safety! Fire is deadly in an RV, with the small spaces and abundance of fuel sources. Time is of the essence to get out and to safety. Make sure that you have proper functioning fire alarms. Get the fire alarm with a 10 year battery for premium RV safety! An LP detector will detect propane gas long before you can smell the rotten egg smell of a propane leak. Left undetected, propane gas can be deadly. Typical LP detectors last 5-7 years and will need to be replaced thereafter. Look for an all-purpose fire extinguisher for Class A, B, and C fires. You’ll also want a pressure gauge so you can make sure that it will work in case of a fire. And a mounting bracket to keep it handy. Fire extinguishers are often mounted just inside the door, for easy access both inside and outside the RV. One of the draw backs of fire extinguishers is the mess they make when you use them. As a result, many people prefer fire blankets that smother fires, depriving them of the oxygen that the fires need to grow. Without the mess. Fire blankets are also useful to wrap around yourself in case of fire as a last ditch effort at protection. The biggest producer of carbon monoxide is likely going to be your or your neighbor’s RV generator. 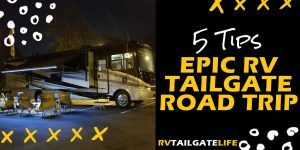 Help protect yourself and fellow RV tailgaters by re-directing the generator exhaust up and over the RV with a generator exhaust system. 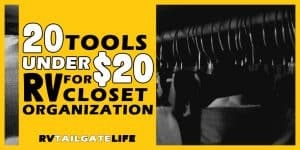 These are so useful, they are often required at tailgating lots. It is really inevitable that you will get cuts, scrapes, and even more serious wounds while RV tailgating. You should have a basic first aid kit as part of your RV safety gear so the tailgate doesn’t need to stop. Tires are vital for an RV to get from one place to the next. And when they blow, they can create catastrophic damage. A tire pressure monitoring system, or TPMS, can often give you advance warning of tire conditions that will lead to a blow out (slow leak or over pressurized). A TPMS system allows you to monitor the tires while in motion, not just when you can park to check the tires. Recording your travels is a great way to insure against fraudulent accident claims – make sure that no one can claim that it is your fault for a rear-end collision when they suddenly stop in front of you. Can also activate recording based on motion sensor, ideal to monitor when the RV is parked between trips. Bonus is that you can record the sites you see as you travel. It is not a matter of if but when you will have roadside trouble. And it will probably be in the most inconvenient place and at night. Make sure that fellow drivers will be able to see you with safety triangles and reflective vests. Head lamps are great because you still have both hands to work on the RV. And when you break down at night and you are trying to fix something, you’ll want both hands. And maybe a third or fourth. So don’t waste a hand holding a flashlight. Also consider additional flashlights with stands. Or solar powered ones. Because really, you cannot have enough flashlights. Ever. Often required by law, electronic braking systems go in your trailer or your towed vehicle. 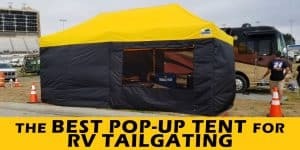 They connect with your RV braking system to activate the towed vehicle’s braking system. This helps to keep the towed vehicle from overtaking the RV and even hitting it. Braking systems will also alert you to many problems with the towed vehicle braking system, including any disconnects from the system. Vital if you are towing a car. Steering stabilizers help maintain straight ahead steering in cases of wind, potholes, curbing, dropping off pavement, and tire blowouts. Stabilizers should be required RV safety gear on all large Class A RVs. In many areas, you could meat up with a bear while RVing. A bear spray will let you fight off a bear before it becomes hand to hand combat. In addition to the spray, many sprays also create a fog to help in case you aren’t so accurate (think adrenaline). Also good at defending yourself from other wildlife. Now that you have all the cool RV safety gear, you can start shopping for more fun stuff. Or the best tailgating chairs ever. Next story Tax Time: Does An RV Qualify for Tax Deductions?